The Australian Power Porting process involves forcing an abrasive medium through a manifold, resulting in enlarged passageways and the removal of power robbing, roughcast surface contours. The procedure removes and polishes metals only where air flows, an ability that traditional methods of porting can't see - let alone reach. While this sounds very similar to Extrude Hone (the American system), the Power Porting system differs in that the 'product' forced through the passages has a design and form that are very different. Two or so years ago Sally and Andrew Sanders, and good friend Albert Lamb, decided to look outside the normal ways of extracting performance from a combustion engine. "We wanted to make our cars faster, something where we could develop it to not only work for us, but also offer financial rewards," Andrew explained. The problem is that totally new ideas don't grow on trees. Fortunately, Andrew and Albert's experience mix was such that they were able to open each other's eyes to new and exciting possibilities. With Albert running a successful country Victorian automotive repair shop, he could offer an open view to how mechanical improvements should be made. On the other hand, Andrew had only enough automotive experience to get him by, yet thanks to 17 years in the quarry and mining industry in an engineering role, he offered some refreshing concepts. "Almost my entire working career in the mining industry has revolved around working out how not to wear equipment. In other words, my job was developing product to reduce equipment wear - in particular, looking for ways to stop abrasives from doing what abrasives do." 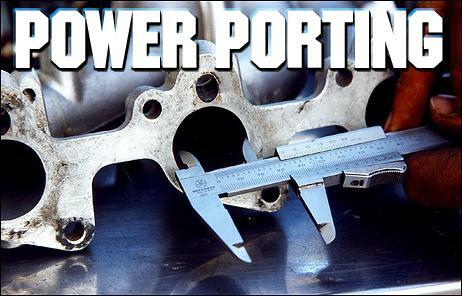 Looking more closely at the concept of Power Porting, it is effectively the delivery of an abrasive medium through the runners of an inlet manifold or other 'portable' components. It works like this; as the abrasive is forced through a runner, it works to abrade any restrictive points or areas. For example, when run through a 90-degree bend, this selectivity or natural occurrence sees virtually no metal being removed from the long radius, which allows for greater air flow velocity in the bend. While the amount of airflow is quite important, also significant is the way in which the Power Porting process can be used to balance airflow. Manifolds and other parts are flow tested and the 'weakest' runners treated to a greater degree of Power Porting in order that a better air flow balance between each cylinder is achieved. In a turbocharger, the surfaces of the standard compressor housing are made as smooth as is economically practical, as any roughness may cause some of the air to detach itself from the surface, causing eddy currents and reducing the overall efficiency. "After Power Porting, our testing has shown a significant increase in flow and a reduction in temperature, especially in hi-flowed turbos". Satisfied of the promise, work commenced on an otherwise stock VL Commodore. "We tuned it to the best of our ability for a baseline, then removed and ported the manifold. The result was an engine that ran very rich, however once tuned it revealed a reasonable gain in power while transforming the drivability", Albert enthused. "The engine was so much better, more responsive, smoother and more powerful." In this trim and at 4500 rpm the engine delivered 168 horsepower to the rear wheels. Testing revealed that the inlet temperature from the turbo was a high 142 degrees C, which had the boys thinking the turbo was inefficient. Modifications involved a number of changes to the diffuser angle, and Power Porting the turbocharger exhaust housing and exhaust manifold. A significant 40 degree reduction in temperature was revealed. While the wastegate had been set at the afore-mentioned 15 psi, the changes had such an effect on the engine's efficiency that the boost skyrocketed. They of course restored max boost to 15 psi for a result this time of 208 rear wheel horsepower (rwhp). The turbocharger's comp cover was Power Ported, resulting in a rwhp figure of 235! The cylinder head was then removed, with the boys noting that numbers five and two pistons had suffered greater carbon build up than the others. Calculations made, inlet manifold runners were Power Ported 2mm in runners 2 and 5 and around 1mm in runners 1 and 6. Next the cylinder head was improved. "We concluded that as there was so much experience in head porting out there, that we could stick with hand porting. We can Power Port a cylinder head, however intricate porting of certain areas isn't possible". Thanks to mods four and five the engine offered vastly improved throttle response and a much reduced inlet air temperature. Over-fuelling was also noted, so the extra injector was removed. Another significant change was a boost drop to nine pounds. "This was as a consequence of the engine becoming much more efficient". The result: 280 rwhp - and remember the 4500 rpm rev limit! Camshaft timing variations followed, the boys noting that no extra power could be gained with the stock stick, rather it was a case of shifting the power around. "The stock cam is no good after 4500 rpm anyway, so revving the engine is useless." A new cam grind was needed, the boys playing with numerous custom Crow Cams grinds offering greater lift and duration. They eventually settled on a particular grind that really woke up the engine - like to the tune of 340 rwhp! All along the RB30 has been run on Shell Optimax fuel, the stock management system and for the latter part, a stock fuel delivery system (apart from the pressure reg). Incredibly, using these stock parameters the horsepower just continued to rise. For example, having a 'bigger' camshaft offered the opportunity of playing with higher rpm, so for the record Albert spun the engine to 7000 and hey, it coughed up an incredible 420 rwhp. Not bad for an engine with a camshaft and porting and a turbo with a larger compressor! Albert and Andrew then decided, "We wanted to see what engine and turbo efficiency would be like if we retained the stock turbo in its normal position, while adding a secondary large capacity Holset turbo (with airflow meter mounted on the side). The Holset compressor side would deliver flow to the inlet side of the stock turbo while the exhaust side of the VL turbocharger would deliver flow into the exhaust of the Holset. With this system in place we've seen an incredible 70 horsepower increase at low rpm and with massive torque." At this point, the Centerforce clutch cried enough, so further testing awaits clutch replacement. Power Porting is still in its infancy, due to the boys deciding to initially restrict sales to local punters whose vehicles were, in effect, guinea pigs. Examples include a G180 1.8 litre Isuzu twin cam engine in a local rally car. Power Porting of the exhaust ports resulted in improved drivability, an increased rate of acceleration, an 8 rwhp increase and around 200 flywheel horsepower (thanks to other mods of course). How about a WRX rally car. Yep, simple turbocharger and exhaust manifold Power Porting resulted in an apparently radical improvement in acceleration, improved drivability and 12 extra kilowatts at the wheels. It even sounds like a different engine. Andrew and Albert have appointed a number of Melbourne-based agents, and the results here have also been significant. Blue Chip Tuning has, as an example, played with a VN Commodore 5.0-litre engine whereby in stock trim the engine delivered 193 rwhp, however with ECU recalibration, twin cat exhaust system and Power Ported inlet manifold it developed 235 rwhp! Developments continue and are gaining pace. A Power Ported Tickford XR8 inlet manifold resulted in an average 53 cfm per runner increase. But prices are on the high side, that's for sure. For example, Power Porting a Holden or Ford EFI manifold will set you back around $1100! Prices of between $500 and $800 apply to four cylinder and six cylinder manifolds, while turbo compressor housings are set at around $300. Andrew and Albert wanted to thanks Rod Rainsford of Motivator Race Engines for his assistance in helping them set up their flow benches while offering his porting expertise.